The study also concludes Brits are less emotional than Americans (yay for stereotypes!) and that fiction overall is in a “sad” period now, and has been since the 1970s. Right… Color me not convinced that literature is turning Vulcan. First, there’s the data. The researchers used books digitized by Google. I don’t know the actual numbers, but I suspect that Google’s database is skewed toward the past. What I mean is that Google likely has 75% of the books published in 1900 digitized, while it might have only 5% of the books from 2000. Why? Because the old stuff is largely in the public domain while the new stuff is protected by copyright and lawyers that tell Google to back off. So, just how many of today’s “gush gush” romances or heart wrenching dramas or satirical fantasies are included in the GoogleMind? Who knows. Second, we could just be changing our language when it comes to talking about emotions. It’s possible (hopefully) that as authors we are getting better at “showing” not “telling.” In years past, we might have said Jane was “afraid” outright. Now we might forgo the emotional label and instead show Jane’s tensed muscles, the sweat beading on her forehead, her racing pulse. 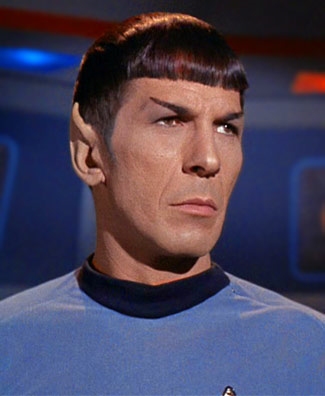 Star Trek and related characters are owned by CBS Studios Inc., and are used under “fair use” guidelines.